VPN.sh can be amazingly cheap if you get a special offer, but that's it's only plus point. If you're after ease of use, features or speed, look elsewhere. VPN.sh is a no-frills service which focuses on the privacy basics only. The company offers no native clients, for instance. To get connected you must either install the free OpenVPN app, or set up your device or operating system manually. This means there's no scope for company-specific bonus features. No ad-blocking, no tracker detection, no smartly designed client, just the regular OpenVPN system. This isn't necessarily a bad thing, as it gives experienced users many more configuration options, but novices could run into difficulties. Even the website is relatively sparse. The Knowledgebase has only eight articles, and most of those are more like news updates than in-depth guides. What you do get is a reasonable selection of servers: 11 in North America, 27 in Europe, 7 in Asia, 10 in Australasia. Regular pricing is simple and straightforward at £5 per month (around $6, AU$8), and there are occasional special deals that give you a year's access for £15 (around $18, AU$25). You may well be interested in the session data the company collects. And how long it's kept for. Or whether the firm prioritises or penalises certain types of traffic, whether any of it is monitored, where logs are kept and how requests for data are handled, but there's no information about any of that here. We did spot a few other points of interest. Torrents are allowed, for example, but limited to a few specific servers only. You're forbidden from transmitting "material [VPN.sh] judge to be threatening or obscene", which is vague and could cover all kinds of web use. There also doesn't seem to be any standard or partial refund policy, so if you do want any money back, you'll have to explain exactly why. Setting up VPN.sh proved a nightmare. Our VPN activation email was late. A couple of links to tutorial pages explaining how to set up OpenVPN didn't work. OpenVPN failed to launch on our first attempt, and when we got it working, the tutorial didn't cover what we were seeing. We switched to use a Windows manual connection instead, and found the server address provided in our email was incorrect. We found a second address online, and finally got connected. We try to make allowances for signup and connection issues as we can't be sure how common they are, but when we see this many, they're probably telling us something. Even the OpenVPN launch problem, which wasn't directly the fault of VPN.sh, is still the kind of thing that can happen when a service doesn't provide its own client. There's always a greater chance of setup hassles. When we did get online, in our tests*, best-case performance over short server distances was average, with latency 12% up, and downloads were down 35% compared to our normal speeds. This tailed off significantly over long distances, with download speeds typically 30-50% of normal. That was still around 10Mbps, usable for many purposes, but less than you'll see with most of the competition. 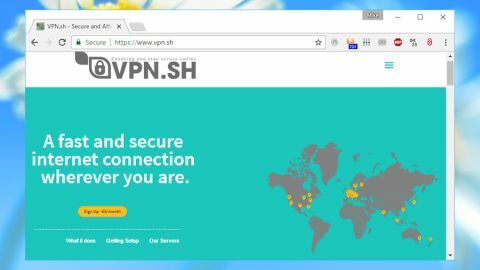 The lack of privacy promises, unfriendly setup and below-par performance are enough to keep VPN.sh off our shortlist. But it can be ridiculously cheap, and best-case speeds aren't too bad, so experienced users short on cash might find the service acceptable.